Was the run-up to the polls free and fair? The run-up to elections was marred by a repression of opposition demonstrations, which were largely banned between September 2016 and early 2018. While the opposition was allowed to hold rallies during the elections campaign, which lasted between November 23rd and December 21st, some of these were violently broken up, while the ability of these opposition candidates to move freely around the country was often curtailed––Martin Fayulu’s plane was allegedly denied landing authorization on several occasions, for example, and all rallies in the capital were banned by the capitol’s mayor for fear of violence. Some of the leading opposition politicians were also prevented from participating on dubious charges. Jean-Pierre Bemba was excluded for having been convicted by the International Criminal Court for witness tampering (although this is a not a crime listed by the electoral law as grounds for exclusion), while Moise Katumbi faced trumped-up charged for real estate fraud. Numerous opposition and civil society activists were arrested or detained, while several hundred were killed in demonstrations between 2015 (when the electoral troubles began in serious) and now. The institutional setup is also heavily skewed in favor of the ruling coalition: the election commission is dominated by people who, although half of its members are supposed to come from the opposition and civil society, have sympathies with the presidency. A similar situation prevails at the constitutional court, which is the arbiter of disputes in the presidential and national legislative elections––its members are supposed to be named by the president, the professional organization of judges, and parliament. In practice, its members sympathize with the positions of the presidency; several have reportedly resigned because they opposed decisions favorable to Kabila In addition, the ruling coalition has benefited from its control of state media and the administrative apparatus to dominate the public sphere during the campaign. Finally, there have been technical problems that call into question the electoral process. The voting register includes almost 7 million (or 17% of total) voters without biometric data, while over 6 million other ID cards have been struck from the register or lost and could potentially be used on election day for fraud. The voter register raises other suspicions, as well: there have been some pretty wild variations in the growth of the electorate between provinces (ranging from 10% in Kasai-Oriental to 83% in Sankuru between 2011-2018) that have yet to be explained. How about the polling day itself, how did it go? Millions of Congolese went to vote on December 30th, and many observers said that despite glitches the election commission worked in very difficult conditions to carry out a hugely challenging task. Still, while the election observation mission have yet to publish their final reports, initial statements suggest significant flaws. The Catholic Church said that based on reports from 12,300 polling centers (over half the total), there were 1,543 incidents reported, including malfunctioning voting machines, many people who could not find their names on the required lists and thus could not vote, blocked access for election observers, and illegal campaigning around polling stations. Several hundred polling stations were created in places where they should not have been, while others could not be located. While significant, that statement does not really give us an idea of the scale of the problem. 1,543 incidents out of over 21,000 polling centers may not have much impact on the final outcome of the presidential vote (it could easily affect other races). A perhaps more damning statement came from another Congolese observation team––AETA, RECIC and Collectif24––which had documented 1,700 of the vote counting operations. They reported that in over 40% of the cases, access was barred to observers (it is not clear whether this means all observers or just some), and that in almost 20% of the cases, the results of the manual counting was different from that provided by the voting machine (although, again, it is not clear how large these differences were). Does this mean the results should be rejected out of hand? No. In the end, it will depend on what Congolese civil society observation missions report. If the Catholic Church and Symocel––the two big observation missions, with 40,000 and 19,000 monitors in the field, respectively (other missions, such as the Carter Center, were not given authorization to deploy)––agree with the results of the electoral commission, it will be difficult for diplomats donors to be too severe, even if there are protests. If, on the other hand, the civil society folks say they know that the real winner of the presidential elections was someone else, we could see some members of the international community reject the results and refuse to recognize the incoming president. At least one would hope. There is also the possibility that the observation missions, who are reportedly under a lot of pressure and have even faced physical threats, will be vague, saying there were many irregularities, but that they don’t know who won the elections. This is basically what happened in 2011, when diplomats lambasted Kabila for deeply flawed elections, but then basically accepted the results, called for negotiations with the opposition and moved on. What should the donor community and regional government do? Stand firm. 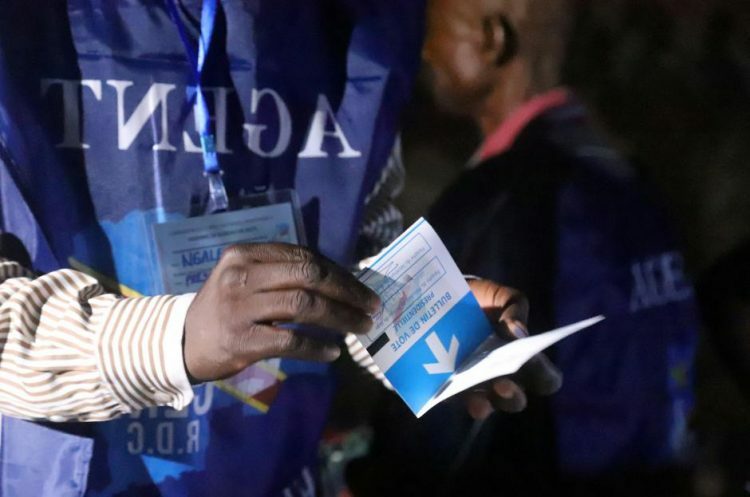 There has been enormous mobilization across the Congo throughout the electoral process, and one would expect Congolese organizations and parties to coalesce against any obvious power grabs, especially if they feel they have sufficient foreign backing. However, if Congolese activists feel they will be gunned down and receive little support from foreign diplomats, mobilization may well falter. In recent days, we have seen fairly weak statements by the United Nations, the Southern Africa Development Community (SADC), and the African Union. The head of the UN peacekeeping mission said it was not up to her to say whether the conditions for elections are acceptable (the mission has a clear mandate to report on abuses related to elections in Article 36 (ii) of its mandate), and a leaked note signed by the head of UN peacekeeping in New York barely made mention of the many flaws of the electoral process. The SADC and AU statements were vague and placed greater emphasis on the positive aspects of the process than on its flaws, although they did criticize some of these. In the end, it is highly unlikely that any of these international organizations would take the lead in saying that results of the elections were not credible. If, however, the Catholic Church and other local observation missions come to that conclusion, things could move quickly in a different direction. The church gave a private briefing to ambassadors today, saying they had gathered results from 20,000 polling stations, and sources close to the church suggest they will have a decent tally by the weekend. The electoral commission is supposed to announce the results on Sunday, although they say that they have been slightly delayed.